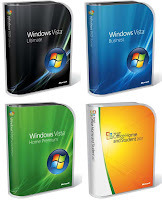 A Thought Shared ....: Microsoft Vista and Office 2007..
At the time of writing, the public release of Microsoft's latest flagship operating system, Windows Vista, is but five days away. Best Buy and CompUSA stores are organizing Vista parties for the night of January 29/morning of January 30 in much the same style as happened for Windows 95. Other stores around the world may well follow suit. Windows Vista is slick and good looking. Searches are faster, memory management is better, security is better, and graphics handling is impressive. I have been using Vista Ultima te since November 18 (beta testing prior to this date), and I can honestlty say that I do not want to go back to using Windows XP Pro. Program compatibility is surprisingly good, as is native support for computer hardware. Microsoft have 19,500 device drivers lined up for release into Windows update to coincide with the public release. What this means is that there is a good chance that your existing peripheral devices like printers and scanners will still work (subject to the device manufacturers supplying drivers to Microsoft). Hardware requirements are well in excess of Windows XP, depending upon which version of Vista one wants to run. Vista takes up more space, requires more memory, and a better graphics system than is found on older systems, but these computers may still be able to run Vista Basic. Most home users will probably opt for Vista Home Premium which now includes Media Center. For more on the editions available click on this link.. Anybody wishing to upgrade a computer to Vista should click on this link.. Question #1.. will you need Vista? Most probably not. Question #2.. will you want Vista? Absolutely yes! Microsoft Office 2007 will also be released. The four major components of MS Office get a major facelift with the advent of the 'Ribbon'. This is a context sensitive menu system that takes the place of the old drop down menus. It takes a little time to get used to it, but what it does do is present many features that you may otherwise not have discovered in the older versions. It has also been given a Vista 'look', and is very impressive. For more on MS Office 2007, go to this link.. There is an online Office demo where you can see the new features in action.